The areas we cover locally are highlighted in Green on the map below (Zone 1). The price for a minimum 2 hours in these areas is £280 for standard pen & Ink caricatures. For iPad caricatures, its £350 without printing and £380 with printing. For bookings taking place in Zone 2, Zone 3, Zone 4 & Zone 5 there's an additional travel charge which will be added automatically after you enter the location of your event on the next page. 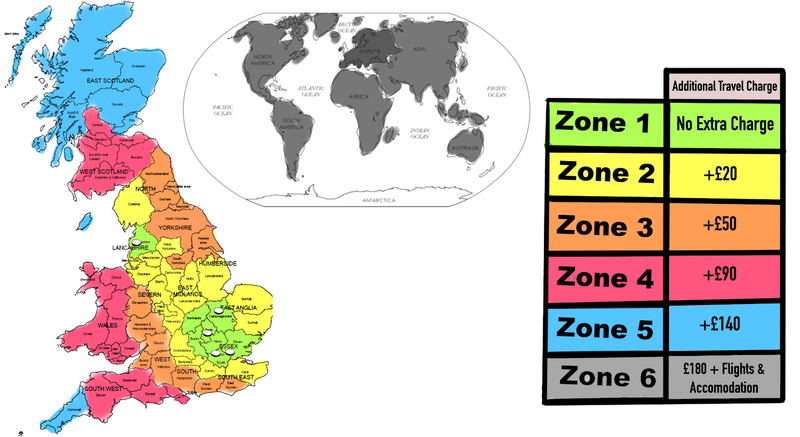 Clients booking for events taking place outside of the UK will have to pay for flights and accommodation in addition to the travel charge for Zone 6. Number of hours* This field is required 1 artist draws on average 12 people an hour. You can choose up to 5 artists on the next page. Number of artists required* This field is required 1 artist draws on average 12 people an hour. You can choose up to 5 artists for the same event subject to availability. Number of bookings* This field is required How many days do you need the artist(s) for? Other - If selected, please enter the specified item manually on the next page and cost on the page after. Do you have a Discount Code? IF so, please enter it below. If not, Just click NEXT. Deposit to secure booking (British Pounds) The deposit is 20% of the total price. Balance (British Pounds) Paid in cash on the day of the booking or by bank transfer/Card/BACs 3 days before the booking. Dress code* This field is required How should the artist dress for the event? Paper branding details (optional) Please enter the wording you would like to be added on the paper. If you have a logo, you can upload it on the next section. Please upload your logo (Optional) If you would like us to add a logo to the paper, please upload it below. If you don't have it, you can email it to us later. Billing Address Please enter the full billing address including post code. If you don't have it now, you can email it to us later on. BOOKING ID ....DDMMYYCC DD is date. MM is month. YY is year. CC is clients initials. Your booking is only confirmed once the deposit has been paid unless agreed otherwise. The artist has the right to take another booking if the deposit is not received within 7 days of sending the confirmation email. If the Client decides to cancel after the booking has been confirmed, their deposit will not be reimbursed. If cancellation is made less than 90 days before the booking date, the Client will be required to pay an additional cancellation fee which will amount to 40% of the total balance. If cancellation is made less than 30 days before the booking, the Client will be required to pay the full outstanding balance. If the Client decides to change the date of their booking more than 7 days after it has been confirmed, he/she will be required to pay a new deposit if the initially booked artist is not available on the new date and a replacement has to be arranged. The Client must provide free drinking water or a soft drinks for the artist at the event. For bookings lasting 4 hours or longer, the client must allow a 15 minute break for artist. For bookings lasting 6 hours or longer, two 15 minute breaks must be allowed for the artist. For bookings lasting 8 hours or longer, two 20 minute breaks must be allowed for the artist. For bookings outside the United Kingdom, the client can choose to book suitable accommodation (hotel) for the artist (s). This should ideally be within 5 miles of the event venue. Alternatively, the Client can choose to pay a fee for the artist to book their own accommodation. If the artist decides to cancel the booking after the deposit has been paid, that will be a direct breach of the agreement and he/she must reimburse the deposit. If cancellation is made less than 30 days before the booking, the Artist must also aid the client in finding a suitable replacement. If the replacement is more expensive, the artist must pay the difference of up to '£100'. The client must pay the deposit to confirm the booking unless agreed otherwise. If paying by BACs, the remaining balance must be in the artist's account 3 days prior to the booking. The Artist has the right to cancel the booking if payment is not with them before the start of booking. You can also pay the balance by cash or card on the day. When paying on the day, the balance must be paid when the artist arrives for the booking to avoid long delays after the event trying to locate the person paying. If you fail to make the balance payment on the day of the booking without prior agreement with the artist, you will have 3 days to make payment by bank tranfer, failure to do this will result in daily late payment charge. The late payment rate is 2.5% per day.